Residing just south/southwest of the hustle and bustle of Tampa and St. Petersburg metropolitan areas, Longboat Key is bursting with the laid-back attitude of the tropical paradise for which Florida is famous the very same atmosphere that keeps tourists coming back year-after-year and encourages some to take up residence forever. The quaint beach town is chock-full of promise and loaded with all sorts of recreational activities that’ll mark Longboat Key as a cherished destination for years to come. One of the most affordable beach resorts located on Longboat Key, Casa Del Mar offers guests all the amenities available at other accommodations without the rigid minimum-stay policy. At Casa Del Mar, guests can book a four- or seven-night stay or longer, if they desire. This beachfront vacation rental is located just steps away from the Gulf of Mexico. Casa Del Mar’s guest rentals are fully furnished. Two bedrooms, two bathrooms, a full-service kitchen and more. Additionally, guests enjoy the resort’s on-site features, such as the grills and pool, they can explore the beachfront or relax in one of the resort-provided beach chairs and umbrellas. The beach is never out of sight from each unit’s private patio or balcony. Paddle along in a single or tandem kayak, or canoe, to explore the untouched natural beauty of the tropical Florida landscape. Navigate the maze of mangrove tunnels that give shelter to an ecosystem of native birds and plants on your own, or take a guided tour. Guided kayak tours at sunset and night, as well as dolphin and manatee tours, are also available. Get your heart racing as you charge across the ocean’s surface and jump waves on the back of a jet ski. While a valid Florida boater’s license is necessary to operate one (if you were born after 1988), a quick on-site test to issue a temporary license will get you on the water and churning wake in no time. For those who want to gently glide along the water’s edge, windsurfing is meant for you. Suitable for beginning sailors to advanced, all types and sizes of catamarans are available. Whether you prefer to slowly cruise along the Gulf Mexico to take in the sights or the throttle of a speedboat for high-thrill activities, like tubing and waterskiing, the area’s full-scale marinas stock every type of marine craft imaginable to suit your aquatic adventure. The boats, which vary from 17’ to 24’, are available for half-day, full-day, and multi-day excursions. No matter which type of vessel you choose, you’ll be navigating the Florida waterways in comfort and style. Take in the full glory of the Florida sunset upon a guided sunset cruise. As the sun dips slowly into the Gulf of Mexico, you’ll have a perfect, uninterrupted view. Live music, cocktails, and dancing keep the party going well after the sunset. Keep your eyes peeled for the party dolphin and manatee sightings are known to happen while cruising along the shoreline. A sunset tour is a great way to spend time with the family or significant other. Most tours can include appetizer type foods. Or enjoy an evening drink as the Florida sun melts over the gulf. If sailing isn’t your cup of tea, there are plenty of options for a motor vessel. Either way, it is just you and the evening breeze to keep you company. Make sure you take plenty of pictures. No sunset is ever the same. Dolphins love to frolic and play just offshore Florida’s West Coast, making Longboat Key a prime spot for dolphin-watching. Florida’s other well-known resident marine mammal, the manatee, hang out in these warm tropical waters as well. Guided dolphin and manatee cruises insert you in the middle of their playgrounds. You’ll frequently see pods of these majestic mammals interacting in the wild. Longboat Key is teeming with native Florida wildlife. Furthermore, the historical areas that are packed full of decades of interesting stories. During your relaxing cruise along the shoreline of Sarasota Bay, your guide will point out different species of birds, flora, and fauna. While taking in the sights and sounds, receive a history lesson of the area and its folklore. You can receive your diver certification in a few simple steps. Now you can explore underwater reefs, ledges, and shipwrecks that are hidden throughout the Gulf of Mexico. Mystery awaits you just below the surface of the crystal clear waters off Longboat Key. The dives, which vary from 10-25 miles offshore, offer you an opportunity to connect with nature and admire Florida’s bountiful marine life unlike any other. Even if diving isn’t your forte, you won’t miss the chance to observe the tranquility of Florida’s underwater realm. As you float along the water’s surface equipped with a swim mask and snorkel, observe the ebb and flow of the sea creatures below you, such as fish, seagrass and hermit crabs. Take back a piece of tropical Florida and go “shelling” along the area’s surrounding sandbars. If you book a snorkeling excursion, many will offer the chance to hunt for shells within the same package. Sports-fishing enthusiasts will be right at home in Longboat Key, where half- and full-day deep sea fishing charters will have you bringing home some of the Gulf of Mexico’s biggest catches bragging rights included. Reel in grouper, snapper, tuna, shark or other sea beasts. Or keep the fishing local to Sarasota Bay, with numerous key spots that not only offer up prime catches but also opportunities for bird watching. For those adventurous types looking to soar above the waters of the Gulf of Mexico and beachfront, parasailing is your answer. There’s nothing like gliding through the air at 800 to 1000 feet to get your adrenaline pumping. As the salty breeze runs through your hair, let your worries from the real world melt away. Soak in the beauty of the tropical scenery with a birds-eye-view of the Longboat Key shoreline and nearby Anna Maria Island. Paddleboarding offers the benefit of a full-body workout among the breathtaking scenery of the open ocean and beachfront. The boards navigated either by kneeling or standing on them, depending on the user’s experience level and balance. A collection of boards ranging from 12’ to 14’ suit every type of paddleboarding adventure, from racing to cruising. What this tiny curvaceous strip of undeveloped shoreline lacks in space, it makes up for in great views, bird watching, and fun. Beer Can Island, a boaters’ oasis and party central located at the northern tip of Longboat Key. The location is the prime spot for tourists and locals alike to gather with their friends, anchor their boats, sunbathe, fish, or grill up some fresh catch. And when the party carries on well into the night, boaters regularly set up tents and camp on the island. Formed by tidal currents, Beer Can Island acts as a greeting center to the boaters traveling under the Longboat Pass Bridge nearby. We found a great article about Beer Can Island by Carrie Gillaspie. She provides some great images and simple preparation guide if you plan to make the trip. Whether you’re seeking a romantic adventure with your significant other or an educational one for the whole family. Horseback riding on the beach is the most unforgettable beach experience out there. The highly trained horses are suited for every type of rider. Furthermore, a guide will be present at all times to teach you some fun tricks, like “horse surfing.” Two local companies offer this service: CPONIES | Beach Horses. White Sands of Casa Del MarIf relaxation is the only item on your vacation schedule, there’s no better place to unwind than on Longboat Key’s expansive 12-mile strip of sugar-fine sand. Unfold a beach chair for sunbathing, or a couple of blankets and an umbrella if you’re bringing the whole family. With plenty of beachfront, you’ll have no trouble finding room to lay out, play beach volleyball or football, and build a couple of sandcastles. Immerse yourself in discovery at the Mote Marine Laboratory & Aquarium, which lives up to its name doubling as a working lab which is viewable to the public with ongoing research and a showcase of more than 100 species of marine life. Come face-to-face with a nurse, blacknose and sandbar sharks as you feed them during the center’s Shark Encounter. Observe them as they interact with goliath grouper, tarpon, stingrays and more in the 135,000-gallon shark habitat tank. Shark enthusiasts will be in heaven among the lab’s extensive shark research, which is only of its kind recognized by U.S. Congress. Two touchable tanks and numerous exhibits on a whole range of marine life will provide hours of entertainment. Not only is Mote Marine known for its resident manatees, otters, sea turtles and other critters, but it is also praised for its animal care, conservation efforts and educational programs. Longboat Key’s picturesque setting gives way to some breathtaking views. The eateries that are perfectly positioned to take in the views. 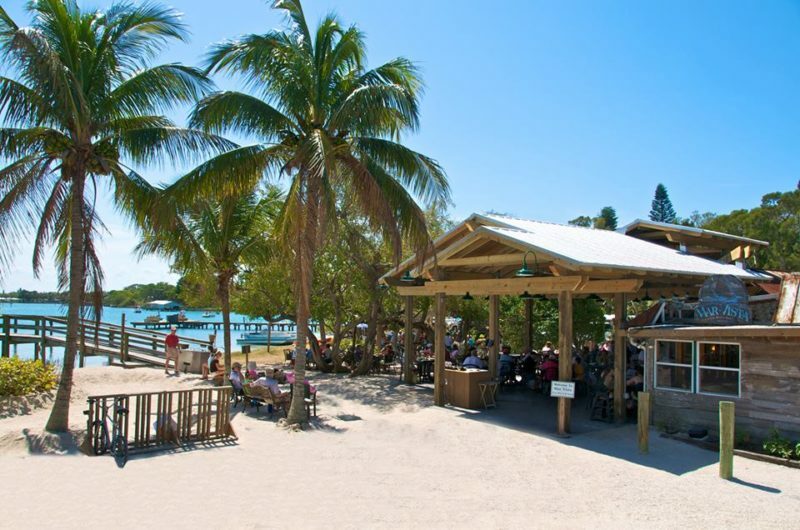 Located on the northern end of the beach, the Bayou Tavern impresses guests with its waterfront views. Enjoyable from both the indoor and patio dining areas. With a food selection of classic authentic Italian dishes and pizzas. Take a trip back in time to Old Florida, circa 1912, at Mar Vista Dockside Restaurant & Pub. Considered one of 12 oldest surviving structures on Longboat Key. Mar Vista’s menu reflects a blend of traditional Old Florida fare and modern delights. All made with fresh Florida seafood and served indoors or on the covered patio overlooking Sarasota Bay. This waterfront restaurant has a dock for boaters to anchor their crafts. Enjoy a meal after a long day on the water. Additionally, the restaurant encourages you to leave a dollar bill with your name on it on the wall. Hailed for the best grouper sandwich on Florida’s West Coast, Dry Dock Waterfront Grill’s menu boasts an award-winning American Pub-style fare with a gourmet twist. In addition to the fresh fish, the menu includes a slew of sandwiches, cantina specialties, pasta entrees, burgers and more. Both the second-story indoor dining room and outdoor chic patio seating. Also, adorned with string lights, firepits, and upscale furniture. This serves up panoramic views of Sarasota Bay and the famous Florida sunset. Strolling along the shoreline, it’s easy to see why Longboat Key is one of Florida’s most beloved destinations. Miles and miles of sand provide the perfect opportunity to relax. Or discover seashells, while a plethora of water sports satisfy the bold. Luxury resorts, unforgettable dining, and enriching experiences are never out of reach. Regardless of what type of adventure you’re looking for, you’ll find it at Longboat Key. Unwind with us, laugh with us, party with us, explore with us. Create memories with us it all awaits you in Longboat Key!